First published in 1971. First Fawcett Crest Edition 1974. First Ballantine Books Edition 1985. New York: Fawcett Crest 1985. Paperback, 208 pages. If you make it across the border, get us help. Mrs. Pollifax has a beautiful new hat. Perfect for hiding 8 forged passports. So it seems simple enough for her to deliver them to the Bulgarian underground, at the CIA's request. But when the prize-winning geranium grower from New Brunswick, N.J., is involved, nothing stays simple for very long. Mrs. Pollifax is trying to arrange a nice young man's escape from an escape-proof Bulgarian prison, with the aid of fireworks, a rope, a bow and arrow, stocking masks, and a gaggle of geese. All of which will earn Emily Pollifax many new fans, as well as delight those who have previously made her acquaintance. Dorothy Gilman is fluent writer and her texts are easy to enjoy. But, admittedly, I'm not a big fan of spy stories. Besides, after reading the blurb, I'm pretty sure I've already read this story years ago. So, this Miss Pollifax is free to leave my shelf for a new reader. The Elusive Mrs. Pollifax was my February offer in greenbadger's One book a month thread. Now it's on its way to Australia. Thank you so much for sending this. 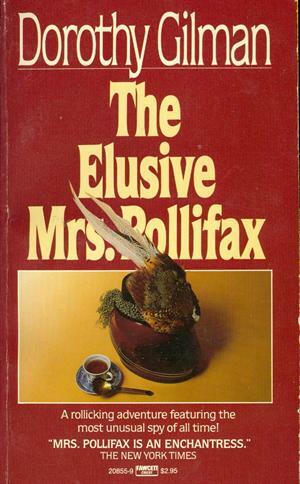 I'm really intrigued by Mrs Pollifax and can't wait to start. I’ve really enjoyed this unusual crime/mystery. I like that there was a bit of comedy to it. Off now to the winner of the Unusual Countries Sweeps. It was really a surprise when I picked up this book -posted in Madrid - from the Mailbox. I suppose I'm the decoy. Thanks a lot, also for the bookmark from Marrakech. To be honest I'm not a big fan of spy stories either. World may have changed since 1971. The book will continue it's journey soon.